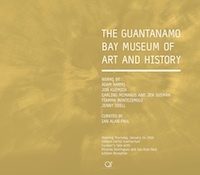 On August 29th, 2012, the Guantanamo Bay Museum of Art and History opened to the public. The museum, located at the former site of the Guantanamo Bay Detention Camp in Cuba, is an institution dedicated to remembering the prison that was active between 2002 and 2012 before it was permanently decommissioned and closed. The museum features a large variety of facilities, including the Tipton-Three Exhibition Space, the Jumah al-Dossari Center for Critical Studies, as well as an extensive array of public programming. Our aim is to allow the public to reflect on the human rights abuses that occurred at the Guantanamo Bay Detention Camp, while also providing a discursively generative and imaginative space for considering the many systems of violence that also continue to persist in our contemporary moment. We're excited to be able to bring one of our satellite exhibitions to UC San Diego's campus to extend our mission of engaging with the public and sharing a selection of works from our permanent collection with you. In framing this history of the present—a collective remembering of a past future—we at the museum actively seek to draw together a dynamic and mobile collectivity of artists, theorists, and other members of the public to create novel conditions of possibility for reflection and imagination. We invite you to join us in this endeavor. After receiving his B.A. in performance and installation art at UC Santa Cruz, Adam Harms transplanted himself to Los Angeles, a city that has become integral to his work. After living in LA less than a year, Adam found himself showing work at the MoCa Geffen and collaborating with film composer Jonathan Snipes and playwright Patrick Kennelly. But it's Adam's work on the Internet that has shined the brightest. With code as Adam's primary medium, he cofounded tightartists.com. The site blurs the line between Adam's role as a patron, curator and artist. It is a virtual installation that enables other artists to display their work and connect with each other in ways that no corporate social networking site allows. His work can be found at adamharms.com. Jon Kuzmich was born in Louisville, Ky. in 1977 and currently lives and works in San Francisco, Calif. Talking about his work, Jon comments: "As an artist, I create labor and process-intensive visual systems that involve the conceptually driven organization of small, synthetic units into large and complex patterns. My work is often inspired by the fact that our perception as human beings is altered and distorted by our belief in systems that we create (religious, economic, scientific, etc.). By virtue of this distortion, systems change our relationship to the world, manipulate our understanding of reality and influence our relationship to the cosmos. In essence, our belief systems keep us confined within a synthetic, human-created world." Carling McManus and Jen Susman met during their M.F.A. program at the San Francisco Art Institute. They became immediate collaborators on a range of projects from timebased work that premiered at SFMOMA to a storefront installation that was exhibited in the heart of San Francisco's Mission District. Currently, they live and work in West Virginia. Born in Rome, Fiamma Montezemolo is both a cultural anthropologist (Ph.D., University Orientale of Naples) and an artist (M.F.A., SFAI). She is currently teaching at UC Berkeley (Art Practice). As an established scholar in border and urban studies, she has designed rigorous and longterm ethnographic artistic interventions at the Tijuana-San Diego border, where she has also resided and taught for many years. In addition to ethnography (a research method she also considers an emerging medium for art practices), she works with various media, including installation, cartography, video, digital photography, industrial materials, performance and archival documents. Jenny Odell is a Bay Area native who makes art from Google satellite imagery. (Portentously, Odell was born not six miles from where the Google Headquarters would eventually be.) Her work attempts to catalog the specificity and fragility of human existence, either through collections of everyday structures like swimming pools, parking lots and billboards, or by isolating crowds on Google Earth from their surroundings. Odell's work has been featured at the Google Headquarters and Les Rencontres d'Arles in France, as well as on the NPR Picture Show, Rhizome, Gizmodo, ESPN Magazine, Die Zeit, NEON Magazine, and Elephant Magazine. You can view more of Jenny Odell's work at her own website at jennyodell.com. Ian Alan Paul is a transdisciplinary artist/theorist living between San Francisco, Barcelona and Cairo. He is most known for his projects and writing that engage in contemporary debates concerning politics, aesthetics, technology and ethics. He works in a diversity of media, including but not limited to digital video, photography, websites/databases/networks, and projection. Visit the museum online at www.GuantanamoBayMuseum.org.